Someone famous once described architecture as the manipulation of space with light and it has long been understood that daylight has a powerful effect on both our physical and mental wellbeing. So you would have thought that we would have reached a consensus about what represents adequate daylighting within a building and would only allow buildings that meet this standard. Well surprisingly this is far from the case and in fact many of our most iconic offices are badly lit, hampering the effectiveness of the people forced to occupy them! It is interesting to note that while there are standards defined in the Building Regulations for most aspects of building design those relating to natural lighting are not very onerous, only requiring a bare minimum of a 2% daylight factor for 80% of the floor area. This means that a fifth of any floorplate can be built that does not meet even this minimum standard. In a typical city tower with a central core the area of the floor adjacent to the core and any desks in this location rely almost exclusively on artificial lighting. 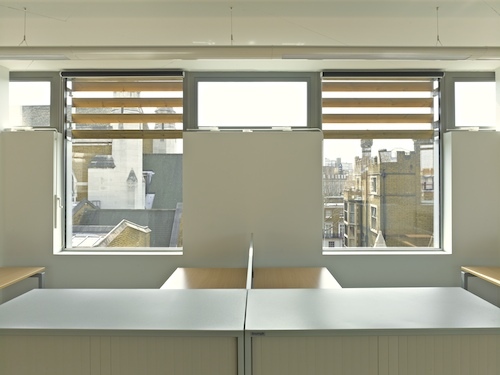 Interestingly, the Building Research Establishment Environmental Assessment Method (BREEAM) for offices awards additional credits where 80% of the floorplate achieves a 4% daylight factor. This is not a standard that the majority of space currently under construction is able to achieve given the excessive depth of most floorplates. I was recently at a seminar where a developer was extolling the virtues of their highly sustainable new office development that had floors of between 12 and 18 metres from the window to the core! While as an occupant you would be aware that there was a window, it would be provide virtually no light to your workstation if you were unfortunate enough to be sat nearest to the core. The issue of the depth of the plan does not only affect daylighting, but also has a major effect on the occupant’s views out. Research has shown that a good quality view is composed of elements that are close to the window, elements in the middle ground and also parts which are more distant, but to be able to perceive the exterior to this level of detail through a window requires the viewer to be quite close. Under BREEAM a maximum of distance of 7 metres from workstation to window is defined as achieving a beneficial view out and is acknowledged by awarding a credit for buildings which achieve this standard. If this arrangement is applied to an office floorplate with windows on both sides it would result in an overall depth of 14 metres which would also be well and evenly lit due to lighting being delivered from two sides rather than one. To ensure that the workplace is comfortable it is important that glare is avoided, particularly on computer screens. This is impossible to achieve on fully glazed facades which allow in large amounts of light but in an unregulated manner, over lighting workstations nearest to the windows but not making any significant improvement to lighting levels of the desks further into the interior. Façade designs that combine solid and glazed sections can overcome this problem, particularly if the façade module is coordinated with the distance between desks. 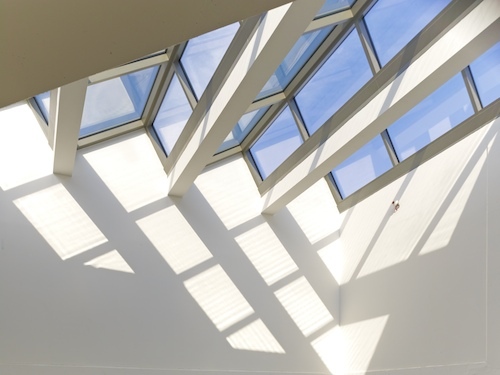 A solid to glass ratio of around 50/50 allows sufficient glass for views and daylighting while providing highly insulated solid sections that protect screens from glare and prevent unwanted solar gains and thermal losses. It is also important where the glass is positioned as the higher the window the better the daylight distribution. 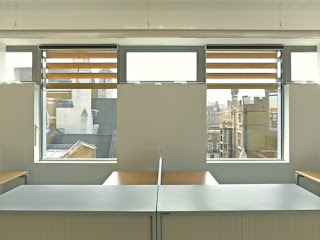 Glass below desk level provides little or no benefit to occupants and often displays just how untidy many offices are! The orientation of windows also has a significant effect on the comfort, or otherwise, of the people who inhabit the building. North facing windows allow in diffused daylight with little direct sun, so thermal gains are prevented at the expense of increased thermal losses. Conversely, south facing glass will experience excessive solar gain and glare if adequate external shading is not incorporated. However it is the east and west facades which present the greatest challenge as the sun hits these surfaces at a low angle which is hard to regulate and which can cause glare and discomfort deep within the interior. 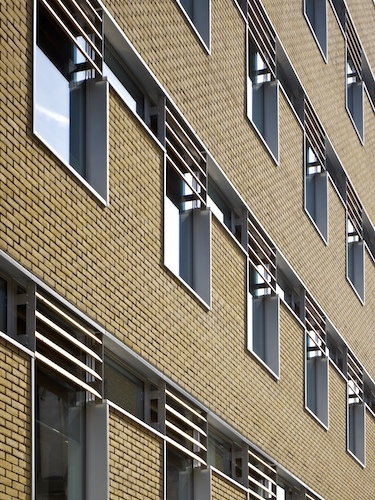 West facing glazing also presents issues of solar gain, delivering as it does a spike in heat at the end of the working day when the building has already been heated by equipment and people. Buffering of west facing facades with other uses like escape stairs or toilets can protect office areas from these unwanted gains. Natural lighting is an essential component of a well tempered environment and deserves careful consideration and intelligent design if it is to be delivered in a manner that enhances the perceived wellbeing of occupants, rather than causing them discomfort. Too much or too little daylight will have direct impacts upon the productivity of occupants which can ultimately affect the productivity of an entire organisation. I passionately believe that user centred design will revolutionise the design of buildings and will ultimately help to create a new sustainable architecture, in which philosophy, intent and purpose replace vacuous beauty, meaningless style and contorted form and I for one cannot wait!